Remodeled in a chic beach cottage style; this home sets a new standard for vacation living! 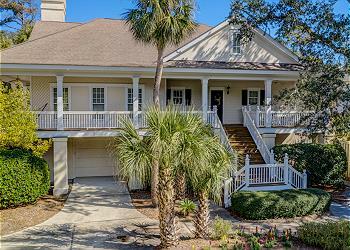 Fantastic 4 bedroom, 3.5 bath home with a private *heated pool just steps to the beach. The main level's open floor plan hosts the kitchen and dining area that allow plenty of space for family gatherings. The farm table in the dining area seats up to 8 and additional seating for 3 is available at the kitchen bar. The kitchen fully stocked with all stainless steel appliances is a cook’s dream! Off the kitchen is the master bedroom with king bedding and en-suite bath. The 2nd bedroom with queen bedding and a private bathroom is also on the first level. Up a few steps from the dining area is the great room which includes a game table. There is plenty of seating for the whole family to have a game night! The 2nd floor has 2 more bedrooms and a full bath. One bedroom has king bedding. The other has a bunk bed set with a double bed on the bottom and the top. It has all the makings for the perfect vacation! •	Private *Heated Pool (12 x 18) *Pool can be heated at an additional charge. The pool has a gas heater. The cost per week is $575-$875 depending on the season. •	*Pool can be heated at an additional charge. The pool has a gas heater. The cost per week is $575-$1,000 (depending on the season) to heat the pool.